There is no shortage of female Christian artists, however there are few that can sing and lead worship as well. Natalie Grant is one that can do both. She is not a large lady but she has a powerful and beautiful voice. She is one of those ladies that seemingly never misses a note nor sings off key. I really enjoyed nar- rowing down my favorites for this article because I never get tired of listening to this lovely lady sing. 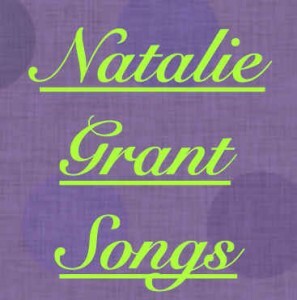 Here are my top 10 Natalie Grant Songs, I hope you enjoy them beginning with the featured song in the upper right of this page “Perfect People” – go ahead let it play and sing along! Featured Natalie Grant Song: Perfect People I had the great honor of hearing Natalie perform in person at a local church a few years ago. She is not perfect and she admits it; though I must say that her voice is nearly perfect as demonstrated by her set that night. You see, that night was when she experienced some technical difficulties with her accompaniment tracks. While her tech crew worked on it she came up to the microphone and simply began singing “Oh Lord my God, when I in awesome wonder …” No music, no accompaniment, just the beautiful, clear voice of this sweet lady, singing her heart out to the Lord. Let me tell you, that was as close to perfect as I have ever heard anyone do that beautiful hymn of faith. By the end of the hymn the entire audience was singing IN PARTS! Even today when I share this with you I feel the tears and the chills as I was amazed when my favorite hymn of all time was sung as Natalie stood in the gap of what could have been an awkward silence. After that hymn she told a little story about a jet ride with her toddlers and then went into singing Perfect People. As Christians sometimes other people expect us to be perfect, but you know what? We don’t have to be perfect because we have a Heavenly, Perfect God that will give us His Holy Spirit to change us from the inside out as we journey this Earth. Jesus is the One who is perfect and when we believe in what He did for us on the cross at Calvary then God looks at us and sees Jesus – Perfection. Perfection is something we will never see this side of Heaven, but as we let the Holy Spirit change us — the will that God has for every believer will be accomplished (Romans 8:29). So it is true, “there’s no such thing as perfect people, there’s no such thing as a perfect life” so we can come as we are and let God do His will. Here is a great behind the song video about this song that Natalie wrote about what she believes Mary Magdalene must have felt when she saw the risen Lord. This is a powerful ballad written by Jordan Sparks for Natalie. They performed it together at the 41st Annual Dove Awards. This is a lovely song about the nativity. Enjoy it with clips from my favorite Christmas movie “The Nativity Story”, along with some clips from “The Passion of the Christ” too. Here is one of the best worship songs out there at the time of this writing. It is so good, I have found a video for you of a lovely acoustic version of this one. Do You Like Natalie’s Songs Too? What ones have I not included do you want to add to the list? Send them to us in the comments below. What a beautiful voice He has given you!!! Next post: Who Were The 12 Disciples or Apostles of Jesus Christ?